[Purpose] In performing laparoscopic hysterectomy for uterine fibroids, the desired level of consistency has not been achieved in cases of intraligamentous fibroids because of the complicated techniques or concern for the complications. 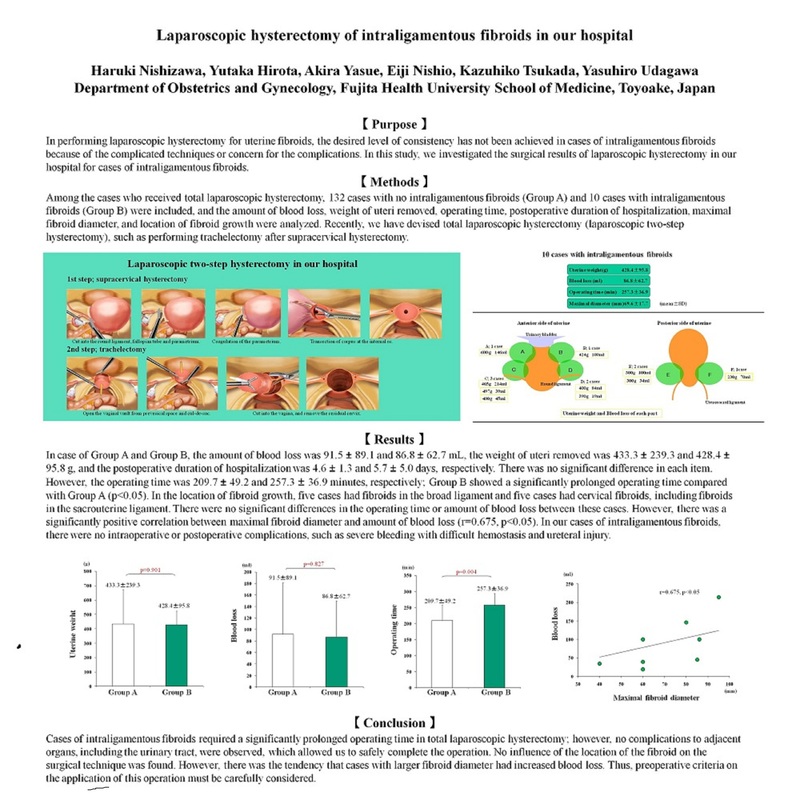 In this study, we investigated the surgical results of laparoscopic hysterectomy in our hospital for cases of intraligamentous fibroids. [Methods] Recently, we have devised total laparoscopic hysterectomy (laparoscopic two-step hysterectomy), such as performing trachelectomy after supracervical hysterectomy. Among the cases who received total laparoscopic hysterectomy, 132 cases with no intraligamentous fibroids (Group A) and 10 cases with intraligamentous fibroids (Group B) were included, and the amount of blood loss, weight of uteri removed, operating time, postoperative duration of hospitalization, maximal fibroid diameter, and location of fibroid growth were analyzed. [Results] For Group A and Group B, the amount of blood loss was 91.5±89.1 and 86.8±62.7 mL, the weight of uteri removed was 433.3±239.3 and 428.4±95.8 g, and the postoperative duration of hospitalization was 4.6±1.3 and 5.7±5.0 days, respectively. There was no significant difference in each item. However, the operating time was 209.7±49.2 and 257.3±36.9 minutes, respectively; Group B showed a significantly prolonged operating time compared with Group A (p<0.05). In the location of fibroid growth, five cases had fibroids in the broad ligament and five cases had cervical fibroids, including fibroids in the sacrouterine ligament. There were no significant differences in the operating time or amount of blood loss between these cases. However, there was a significantly positive correlation between maximal fibroid diameter and amount of blood loss (r=0.675, p<0.05). In cases of intraligamentous fibroids, there were no intraoperative or postoperative complications, such as severe bleeding with difficulty in stopping the bleeding and ureteral injury. [Conclusion] Cases of intraligamentous fibroids required a significantly prolonged operating time in total laparoscopic hysterectomy; however, no complications to adjacent organs, including the urinary tract, were observed, which allowed us to safely complete the operation. No influence of the location of the fibroid on the surgical technique was found. However, there was the tendency that cases with larger fibroid diameter had increased blood loss. Thus, preoperative criteria on the application of this operation must be carefully considered.